There are so many options nowadays for fitness seekers that sometimes it can be difficult to choose from among them. Of course, it all depends on what your goals are and what fits your physical abilities best. In the past, we’ve taken a look at yoga, barre, and crossfit, among others, and this time, we decided to take a look at one of the more popular franchises in the US – Orangetheory. Orangetheory Fitness began in 2010 when Ellen Latham was looking for a metabolic element to offer with her Pilates classes. She opened Ellen’s Ultimate Workout, which consisted of high intensity endurance, power, and strength training, allowing for an “afterburn” to last hours after the class has ended. Orangetheory is a high-intensity interval workout that is based on an individual’s heart rate for fitness level, and includes various components such as rowing, treadmills, and weight-bearing floor exercises. 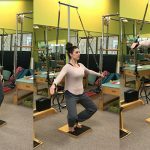 While Pilates can be sequenced in high-intensity intervals, it typically focuses on mindfully precise movements and the entire center of the body, providing greater core stability and fitness. Orangetheory is a group class, while Pilates can be done privately or in a group setting. The point of Orangetheory is to hit the “orange” zone of heart rate, so that participants burn as many calories as possible, as well as keeping them off for up to 36 hours after their workout. Pilates, is not a metabolic workout, and the goal is more about flexibility, core strength, posture, and alignment. 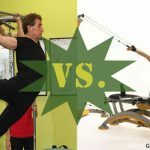 Both Pilates and Orangetheory are wonderful training methods, especially if used together! Many who frequent Orangetheory say that by adding Pilates to their weekly regimen, they have seen a vast difference in their overall health and could not imagine doing one without the other. If you are interested in starting your Pilates journey, contact Dynamic Fitness today!